BULAWAYO, Zimbabwe, Dec 15 2015 (IPS) - Successive poor harvests have diminished Ndodana Makhalima’s household food stocks and the family’s nutrition status. “In the past I could eat umxhanxa (a mix of maize and melon) and inkobe (a mix of maize, cow peas, and groundnuts) throughout the year, but not anymore,” Makhalima said. The country’s rural-based subsistence farmers are facing a myriad of challenges with the Famine Early Warning Systems Network (FEWSNET) warning of another drought during the 2015/16 season, which could further compromise already dire nutritional needs in a country where the UN World Food Programme (WFP) says millions will require food assistance. But it is the financing of the sector, once a major contributor to the country’s GDP, that has further dwindled hopes for relief for Makhalima and millions of other rural farmers. Zimbabwe requires millions of dollars to fund irrigation schemes dotted across the country and while the climate ministry and the meteorological services department announced a cloud seeding exercise in October to boost rainfall, this is yet to take off. The meteorological office also announced it would be buying an aeroplane for cloud seeding, but the department has previously complained of financial constraints that have affected its operations. It is not clear where financing for the aircraft will come from. Experts however say cloud seeding can be done when there are particular clouds that favour the exercise. Announcing the national budget on 26 Nov, Finance Minister Patrick Chinamasa said agriculture will require 1, 7 billion dollars, while setting aside 28 million dollars to fund farming inputs for 300,000 vulnerable rural households. Under the scheme, small-holder farmers will receive maize and small grain seed and fertiliser. ”The importance of this sector lies in its contribution to export earnings of around 30 per cent, 60-70 per cent of employment and about 19 per cent of GDP, that way providing a major source of livelihood for over 70 per cent [of the population],” Chinamasa told parliament in his budget presentation. The day after the budget presentation, Minister Chinamasa told a breakfast meeting that Zimbabwe would sign a 60-million dollar agreement with the UN International Fund for Agriculture Development (IFAD) to finance irrigation which the agriculture ministry is touting as a solution to boost agriculture production. Yet subsistence farmers, who have relied on technical assistance from agriculture extension officers, could face tougher times ahead after the finance minister announced that these officers will face the chop as part of government efforts to reduce its wage bill. These cuts come at a time when farmers seek new farming knowledge and skills to deal with climate vulnerability blamed for poor harvests. The Zimbabwe Vulnerability Assessment Committee (ZimVAC), established by government and which sets benchmarks for rural nutrition with support from the UN World Food Programme, says 1.5 million people or 16 per cent of the country’s rural population, are food insecure. ZimVAC notes that this is a163 per cent increase from last year. Development agencies have tied nutrition to people’s ability to lead productive lives with access to nutrition especially emphasised for vulnerable groups such as people living with HIV and Aids. WFP is already assisting malnourished HIV and Aids and tuberculosis patients around the country through the Health and Nutrition programme, with the potential to assist millions of patients living in rural areas according to the country’s health ministry. vital requirement in anti-retroviral therapy. 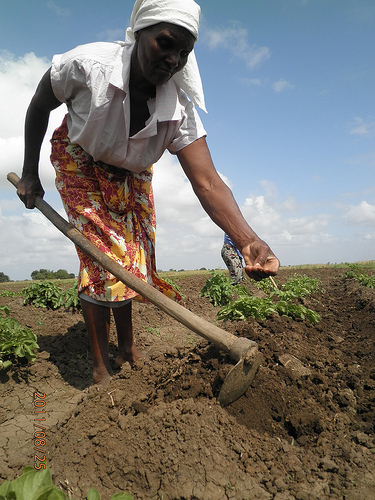 As part of efforts to improve agriculture production and nutrition, FAO and WFP are assisting small-holders in adopting climate smart agriculture, complementing government efforts that emphasise rehabilitation of irrigation schemes across the country. These interventions could offer much-need relief for farmers like Makhalima, for whom agriculture is vital for nutrition and income.